Frame pieces and offer them as a memento of the day? I've also put this question up on social media but thought it would make for an interesting discussion in here as well. I have the Scottish Cup pitch flag gathering dust in a cupboard and have been talking to some people about what would be the best thing to do with it. The two main suggestions were that...I should auction it as a complete flag....or that I should cut it into sections and frame them so lots of people can get a piece of it as a memento. As I said, it's gathering dust at the moment and I fear that if I sold it on as is, it would just end up gathering dust in someone else's house. It's a proper heavy duty canvas type flag material, so it's not the sort of thing that's going to be easily carted around or taken in and out and there's every chance that the weather would not be kind to it. That's the reason I am entertaining the idea of chopping it up because I would rather lots of people had the chance to get their hands on a piece than it ends up going missing or getting wet and rotting in a bag somewhere over time. I can't remember exactly, but it's about 15m x 10m. Keep it in one piece. Part of our history now & will be worth more intact. Go on a trip to get all the finals players to sign it, then give it to the club. A good few air miles tracing down Edward Ofere! 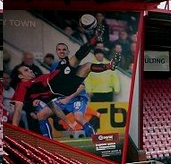 More seriously, I agree that it should be donated to the club. Lads a free agent now. Take him back to the Sneck! It would be wrong to destroy it IMO. 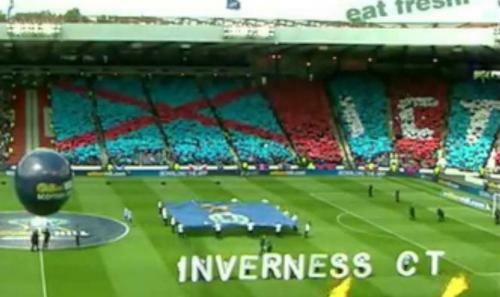 What happened to the letters spelling out Inverness CT, do you have them too?! The letters were at the club. They were a foam board construction, so may not have survived long if stored anywhere damp. For those suggesting I give the flag away. I'll never, ever recover what I have invested in it and the club has already had my "donation". I think you should keep it and it might be worth something in many years to come as I don't think we are likely to win the Scottish Cup again. Do not cut it up. What else do you have in your dungeon ? Add on the words "Scottish Cup Champions, you'll never sing that" and get it framed and stuck up in the Mallard. Realistically, would people pay for a piece of a flag? You'd probably be better to stick it on eBay with no reserve. Think handing it over tho the newly named ICT supporters trust as a free gift would be a goodwill gesture. Doofersdad would it be something the trust would be interested in? Maybe those who are keen for it to be donated could buy it and make the donation themselves? I would personally like to have a piece as a souvenir of the day. Maybe if it was not framed I could get it framed myself along with my ticket and programme. I don't know how the flag came into being and personally I think it would be a great shame if was cut up. But from what CaleyD has said above, it is clear that he has put a fair bit of his own effort and money into the flag and it would seem to me a bit unfair to expect him to simply give it away. I agree with others and don't cut it up, chances are as much as someone says they want a bit of it, ultimately it'll end up stuck at the back of a drawer or the bottom of a box just being a piece of blue material for the most part. Surely keeping it whole and auctioning or even raffling it off would give you some return, all be it not all your investment, but piece of mind the someone else has kept it in tact with the potential to do something with it. At the end of the day, once it's cut up there's no going back. Had The supporters trust or any group of ICT fans for that matter been in possession of the flag last night it would have been the ideal time to display it due to the number of fans in our end. It certainly would have added to the occasion especially with it being on live tv. Cutting it up would be an absolute outrage and I would have to question the motive for carrying out such an act. No-one would want a rag as a momento.The only place to benefit would be the clootie well or the nearest landfill site. Someone might want their flag back. Get it out at Hampden!